I’m just gonna put that out there and recommend that if you do NOT love zucchini, you not read the rest of this post, as I know some people have it in for harmless, delicious, not-that-nutritious zucchini, and I won’t have any of that attitude here. I kind of grew up on zucchini, as it was one vegetable that always proliferated wildly in our family garden. While I have many memories of (unsuccessfully) digging in my heels in protest of picking beans or hoeing potatoes, I did love the fruits (and vegetables) of the forced labour, and now look forward to one day having space of my own to have a garden. We always had so much zucchini that mom would go on a blitz, making zucchini bread, chocolate zucchini cake, zucchini muffins, chocolate zucchini muffins, minestrone soup and chili full of zucchini, bags of zucchini in the freezer for future baking…and she would STILL have boatloads of zucchinis-as-big-as-your-leg to give away. She told me once, “You know you don’t have any friends when you have to buy zucchini”, since everyone who grew zucchini had so much they would give it anyway to anyone they could catch. Mom, I do so have friends. Just not the right kind apparently. But I always feel a little lonely when I buy zucchini thanks to that. 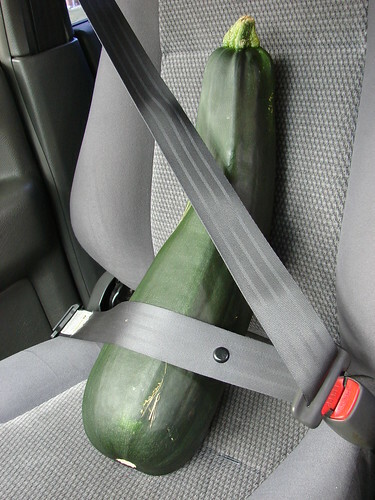 So I strap my zucchini into the passenger seat for company. Such a good listener. As part of the fun, I made these muffins. I have my mom’s plain zucchini muffin recipe which I like with a thick slab of cheddar cheese, but my new version stays moist for much longer, and the chocolate chips make them feel like a real treat. 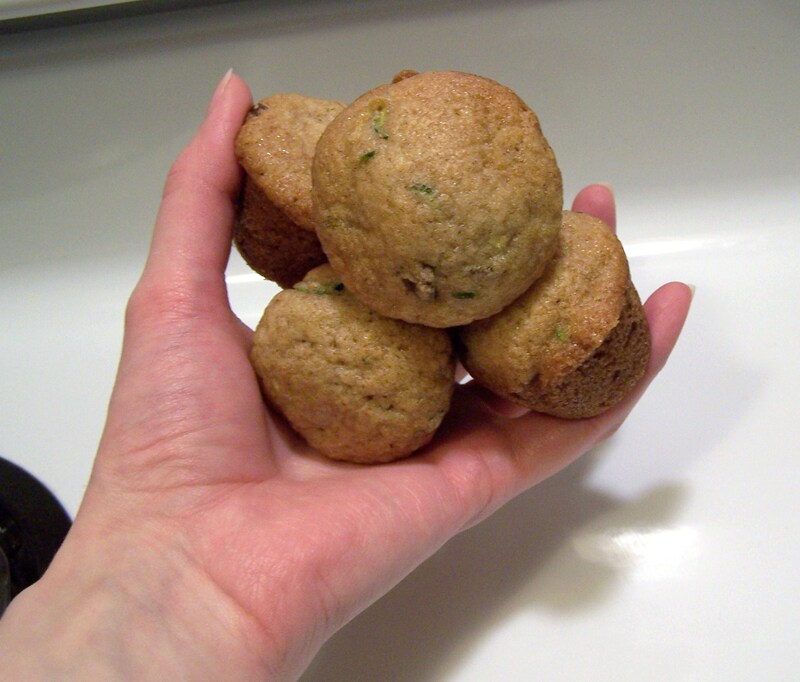 These are, in my opinion, and being well-versed in zucchini goods it is a pretty well-formed opinion, are the best zucchini muffins around. A deliciously sweet way to use up some grated zucchini - if using frozen zucchini, thaw first, then add it all, including the water that comes out of it. Preheat oven to 375 degrees and line 10 muffin cups with paper liners. In small bowl, whisk egg, oil, milk, lemon juice and vanilla. Stir into dry ingredients just until moistened, then fold in zucchini and chocolate chips. Fill muffin cups about ⅔ full and fill 2 empty spots ⅔ full with water to ensure even baking. Bake 19-22 minutes or until tops are browned and firm to the touch. I always have to buy zucchini since I don’t have any friends that grow any. We did a couple of years ago but our yard is too small and not enough sunshine and we got 8 of them. My mom used to cut slices of zucchini and put cream cheese on them. I love zucchini! It goes in my spaghetti, on pizza, chili, etc…and of course in baking! I just love making my double-chocolate zucchini loaf. Gonna have to try this one too! That’s it. I’m growing zucchini! Mmm, thanks! I forgot about the zucchini i’ve got in the freezer! :) I have a faaaaabulous chocolate zucchini bread recipe. Yum. Looking forward to trying these too!